Get a small mixing bowl: stir in it 1 tbsp of water with garlic. Place a large pot over medium heat. Heat in it 4 quarts of water. Add it the pasta with 1 tbsp of salt. Let it cook for 8 to 10 min or until it is done. Drain it. Toss it with 1/4 C of tomato juice. Place a large pan over medium heat. Stir in it the garlic and water mix with oil, red pepper flakes and anchovies for 1 min. Add the tomato and let them cook for 9 min over low heat to make the sauce. Add the capers, olives, parsley, a pinch of salt and pepper. Cook them for 1 to 2 min. 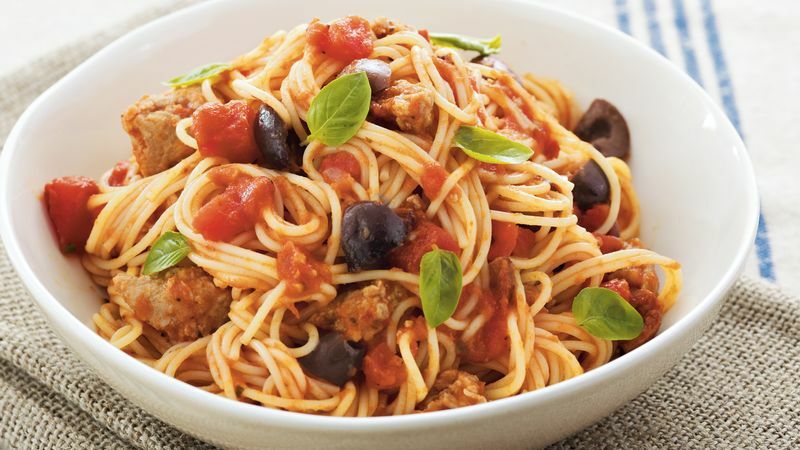 Place the spaghetti on serving plates. Spoon over it the tomato sauce then serve it hot.